For more than a year Turkey’s ruling President Recep Tayyip Erdogan has been looking to re-write the country’s constitution and cement the AKP’s grip on power. Yet the more he reaches, the more it seems he is unable to get to that goal. In the June, 2015 elections the HDP, a mostly Kurdish party, took ten percent of the vote, which gave it seats in the parliament of Turkey, a major victory for a minority party. These elections, like the ones before it have been a contest between the muscular AKP, which blends mild Islamism with populism and it’s supposed economic bonafides, against a mish-mash of opposition parties that have little in common. On one side if the CHP, the old nationalist Kemalist party of secularism, what Erdogan would call the “deep state” party. On the other side has been the HDP or other incarnations of it, which is a Kurdish party. And then there is a radical extreme nationalist right, the MHP. When we look back at 2002 when the AKP first came to power, it took 10 million votes and 363 seats in the parliament and 35% of the vote. 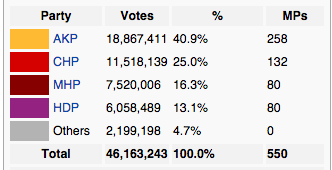 In 2007 it got 16 million votes but only 341 seats in parliament with 46% of the vote. The MHP got 14% of the votes. In the 2011 elections AKP got 21 million votes, some 327 seats and 49% of the vote. The CHP got 11 million votes and 25%. In these elections the various Kurdish coalition parties received around 3 percent of the vote and never crossed the threshold. Now comes June 2015 when the AKP gets only 18 million votes and only 258 seats in the parliament (out of 550 in parliament). The CHP gets it normal 11 million votes, the MHP around 7.5 million, but the big winner is the HDP that garners 6 million votes and 13% of the electorate. This defeat came despite years of intimidation of the opposition, mass arrests of police officers, military officers and attacks on the press and judiciary, all of which Erdogan and his Prime Minister Ahmet Davutoglu blamed for being part of a conspiracy against the AKP. For them the “deep state” which was conspiring against them not only consisted of the army, and various other organs, but also conspiracies of international money, Jews and Armenians. In conversation the AKP might seem more pragmatic, but in speeches it was demagoguing the issues. The failure of the June 2015 elections to bring a major majority, which had actually brought a defeat, meant Erdogan had to find another way to get an election. In July, with a bombing in Kobane and killings of several Turkish security personnel, Erdogan had his war. He claimed to be attacking ISIS, but in fact launched a major crackdown on the Kurdish PKK. Riots and killings followed. Unrest and terror attacks. The November election was supposed to go Erdogan’s way. The concept was that with the HDP’s Kurdish supporters bludgeoned and angry they wouldn’t turnout at the polls. But now it seems the AKP has brought in 49% of the vote, with around 23 million votes. The CHP has got its usual 11 million and 25%, the MHP has fallen to 5.5 million and the HDP has fallen to 5 million. 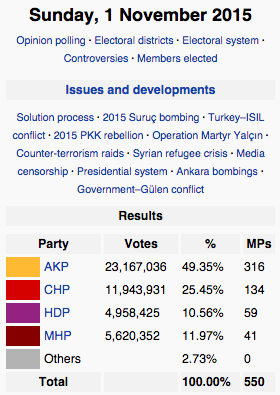 But it seems the HDP will just barely get by the 10% threshold. That means Erdogan has failed. Erdogan would need two-thirds of the parliament to re-write the constitution. But the AKP will have 316 seats. That won’t work. The fact is not much changes in Turkey over the years when it comes to elections. The coastal regions, where once was a large Greek-speaking minority, votes for the Kemalist secular CHP, the “old guard.” The Kurdish regions votes for the Kurds. A few districts here and there in the south go for the MHP. The CHP has been unable to articulate a real challenge. 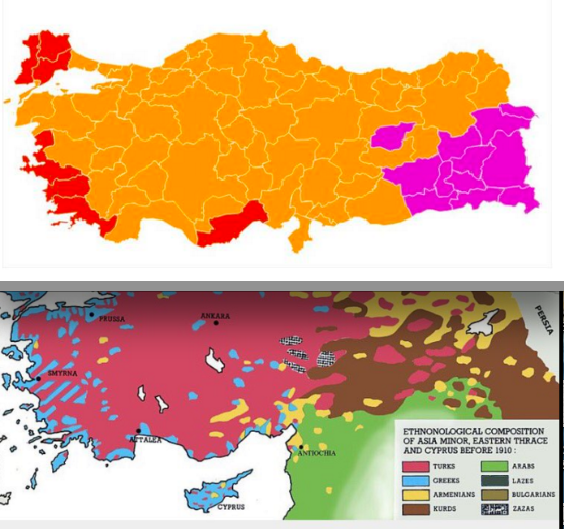 The AKP’s luster of being “new” has long ago worn off. It is still intimidating its opponents with attacks on opposition newspapers or thuggish attacks on opposition parties. It even shut down newspapers connected to the Gulen movement on the eve of elections. But the Turkish people don’t move much. The only thing the AKP can do is get out a few more votes in its own districts, or drag a few votes from the MHP perhaps. Erdogan will now have to find the next stage in the ongoing revolution. This may mean meddling more in the Syrian war or attacking the Kurdish YPG. His war on the PKK is not going anywhere, but it hasn’t achieved what he set out to. With the HDP still in the parliament, he wasn’t able to neutralize the Kurdish voice in Turkish politics. Perhaps more elections will be on the way.